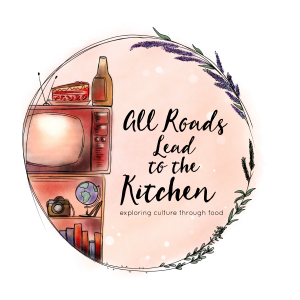 I am keeping curries and curry-type dishes part of my repertoire...I've come to adore the complex flavors and open invitation to experiment with new additions. 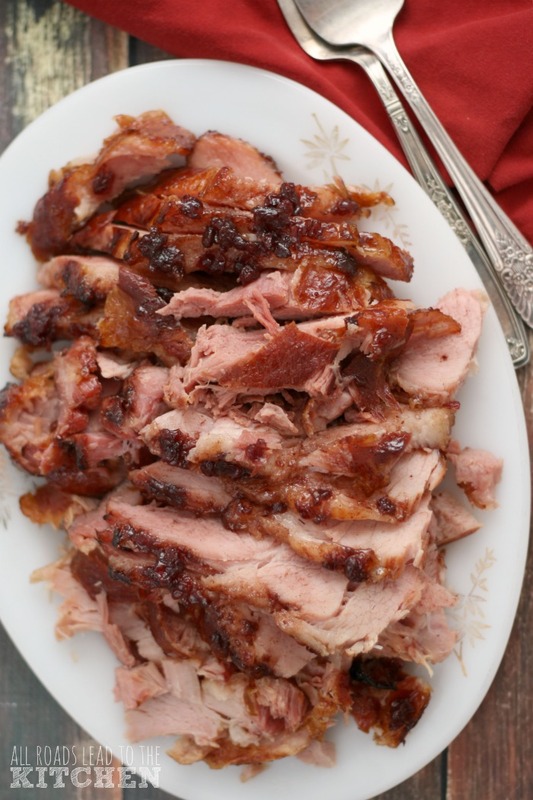 This one is from Tyler Florence..."a good, fast vegetarian meal." Tyler says it is a beautiful way to experience the taste of India...but I think I've become accustomed to the more Thai-versions of curry...with the addition of coconut milk. I actually didn't find the final result to be very flavorful...so I added a few more things and ended up with a dish I really enjoyed. I'm gonna have to say that I think I had beginner's luck because my first-ever curry is still my favorite! Curried Cauliflower with Chickpeas and Tomatoes slightly adapted from Tyler Florence's Eat This Book 1/4 c. ghee I used Olive Oil 1 onion, finely chopped I sliced it 1" piece of fresh ginger, peeled & julienned 2 Tbs. 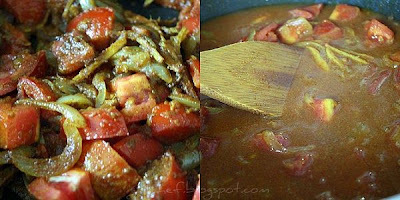 curry powder* 2 ripe tomatoes, chopped I used 3 romas...cuz I got to raid a garden 2 Tbs. tomato paste 1 head cauliflower (~1 lb. ), cut into florets 3 c. canned chickpeas, drained & rinsed I used 2 (15 oz.) cans kosher salt I used sea salt Fresh cilantro leaves, for garnish 1 can coconut milk ground cumin- to taste ~1-2 Tbs. brown sugar couple squirts of Sriracha Chili Sauce Heat the ghee in a deep skillet or pot over medium heat. 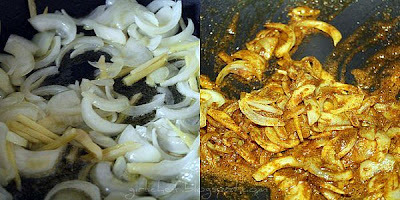 Add the onion, ginger and curry powder. Cook, stirring for a few minutes to soften the onion. Add the tomatoes and cook, stirring, until the tomatoes break down and soften, about 6 minutes. Stir in the tomato paste and 1 cup of water to dissolve paste. 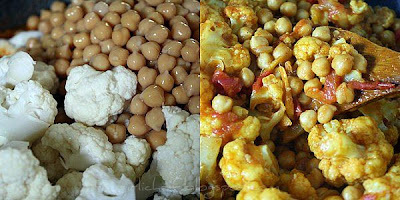 Gently fold in the cauliflower and chickpeas. 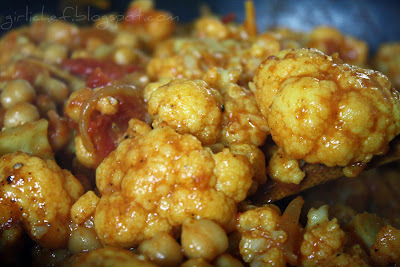 Reduce the heat to medium-low, cover and simmer until the cauliflower is tender, 15-20 minutes. 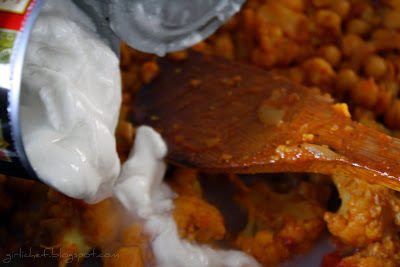 Uncover and continue cooking until the sauce has thickened and the cauliflower and chickpeas are coated with a thick gravy. Season with salt. Here is where I thought it needed something more. The following were my additions...add coconut milk, cumin, brown sugar & sriracha. Let cook for a few more minutes...I like it a little saucy. I served it over rice noodles. Garnish with cilantro. *Tyler's recipe for Curry Powder (from same book) 2 Tbs. coriander seeds 1 Tbs. cumin seeds 1 tsp. fennel seeds 1/2 tsp. whole cloves 1/2 tsp. mustard seeds 1 Tbs. cardamom seeds 1 Tbs. whole black peppercorns 2 dried, red chiles, broken into pieces, seeds discarded 1 Tbs. ground turmeric In a small, dry skillet, combine all ingredients except turmeric. Toast over medium-low heat, shaking the pan often to prevent the spices from burning, for a couple of minutes until the spices smell fragrant. Let the spices cool. In a clean coffee grinder, grind the toasted spices to a fine powder. Add the turmeric and give it another quick buzz to combine. Use immediately or store in a sealed jar for up to 2 months. Although I didn't use this...it sounds awesome. Maybe I would have liked the curry as-is, if I had. I don't know. I do have a pretty good curry powder, that's why I didn't make this. Well, that and the fact that I cannot afford cardamom seeds ($17.00 for an itty-bitty jar). This is my entry for Tyler Florence Fridays this week. Please head on over to see what everybody else cooked up with Tyler! That is a beautiful dish. full of flavor. I got my giveaway in the mail. I already used the coupons and the bag is awesome I love it. Thank you so much!!!! I have been seeing curry a lot lately. I need to have some soon:) Delicious! 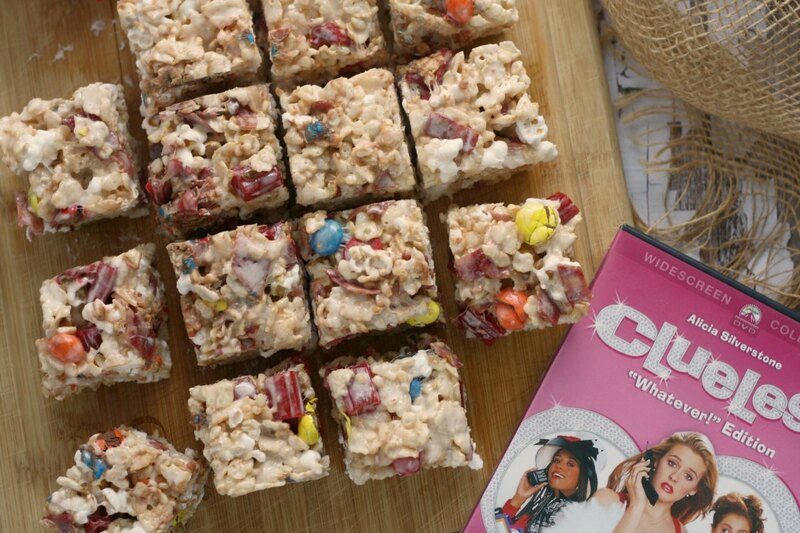 This looks amazing and after reading the ingredients, i have to try this. I have some chicks peas that I can now do something really tasty with! Ummm now I want it for lunch, but all I have are chickpeas...glad you are coming to like this so well, that way I know when I visit next year I can place my order ahead of time :) I will make the roti/chapattis (if you want)! I can get cardamon by the bushel for 17 bucks - I will mail you some e mail me your address again! What a beautiful dish. I love Thai curries so this is a natural for me. Looks sooooo yummy! I'm also making curry today, which I'll post later. I'm like you in that I love coconut milk in my curries. Depending on the region of India, coconut milk is commonly used. I love curries too! Not to mention this one full of vegetables and chickpeas! Yum!!!!! This recipe might undo my fear of curry. I have good luck sometimes and bad luck sometimes. Of course if I didn't have to try a new recipe every time I made something that would probably help. Since you trust this one, I will too. I agree, the addition of coconut milk to a curry gives it great depth. This one looks like a keeper! I admire your sense of cooking adventure. I'm still a little chicken to serve my " meat & potatoes hubby" a curry dish. I think he would have a seizure, lol. The way you feel about currys is the way I'm feeling about popsicles :-) I keep making them, they're so fun and different everytime. I love curries too. The ultimate stew for lovers of big flavour and spice. 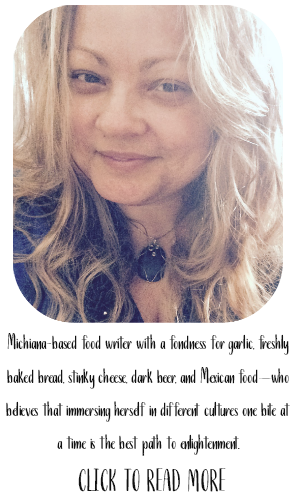 I am with you - popular recipes are often far too tame. Spice 'em up! Your making me feel brave enough to attempt a curry! You make it look so easy. I like the changes you made especially the coconut milk. It makes it nice and creamy. I love this! I saw this one and wanted to try it--good to know to add the extra seasonings! It looks delicious! Girlichef, how wonderful. I've never made anything with curry before, but I love chickpeas. I'm going to try this recipe, I bet it's good. I also gravitate toward the Thai style curry. This looks so good! Too bad I'm the only curry lover in this house. I wanna try it! 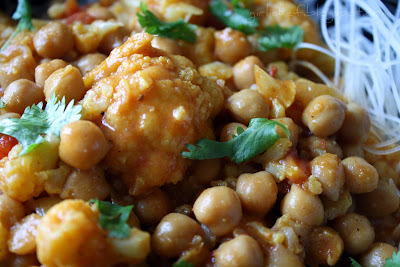 What a great combination...cauliflower and chickpeas, with good Indian spice and a bit saucy. Sounds perfect! Thanks for sharing. I love your enthusiasm for all things curry. It makes me want to try your original al the more. 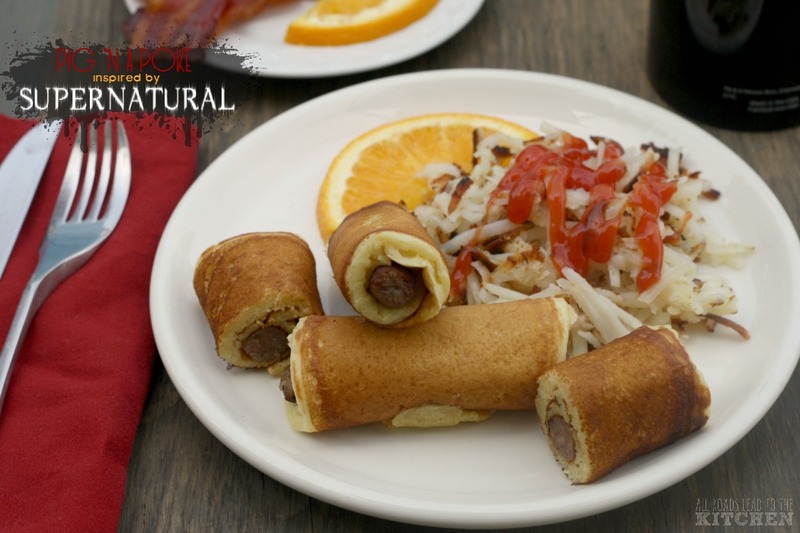 Great substitutions.. looks and sounds unbelievably tasty. I am bursting with laughter over Coleen's remark, that would be Ole Sweetie-Pi as well. I'm beginning to think that her beloved and mine may have been separated at birth LOL!!! Your curries look very very good! Curry is always so enjoyable...looks and sounds delicious! That looks so wonderful! Mmmmmm! Oh yes, those cardammom seeds are expensive. Glad I am able to get them from a bulk store so I can buy only the one or two I need at a time. Much cheaper that way. 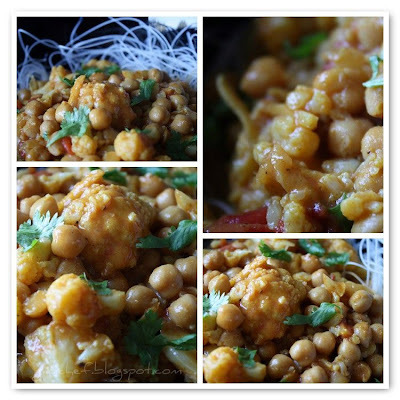 A delicious veggie curry, love the cauliflower and chickpeas here! Very yummy! The nectarines are a great addition. I have never made a curry. I think you may be pushing me to try this. 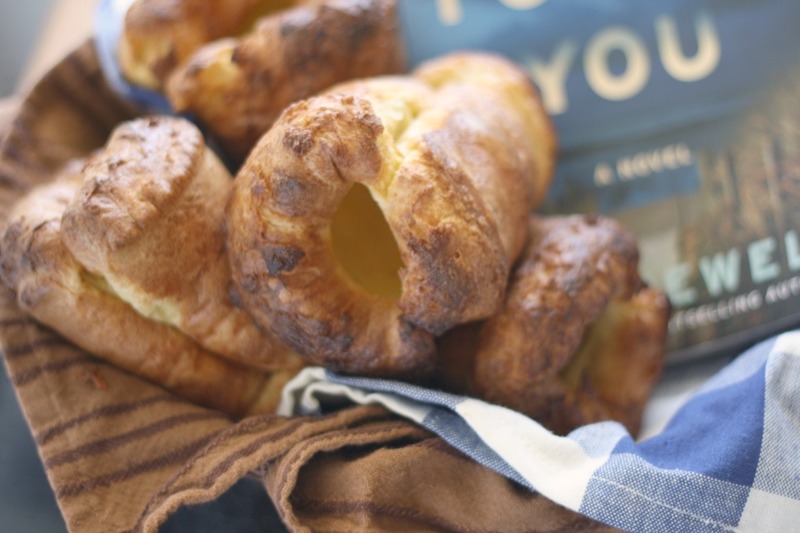 Sound like a healthy option for comfort food.